Rigid LED Back Up Lights UNIVERSAL - Dezod Motorsports Inc - Home of the automotive performance enthusiast since 2002. 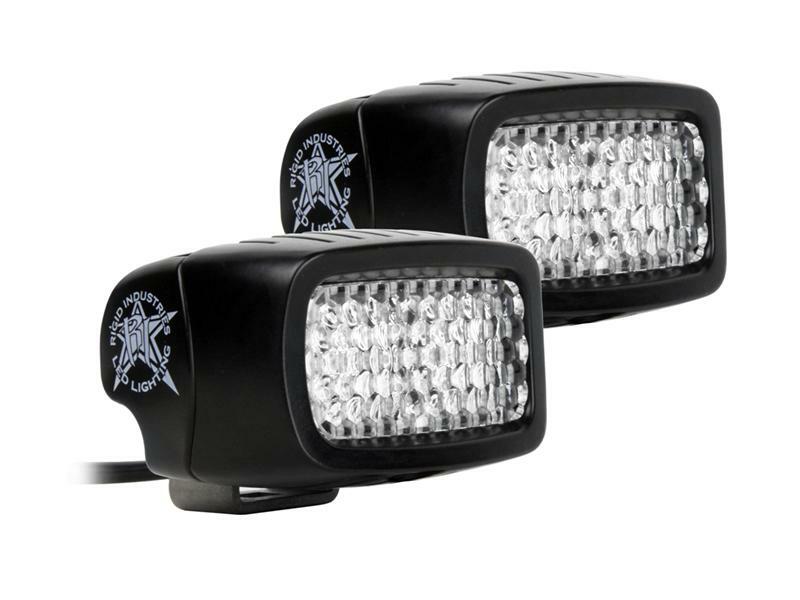 This new lighting kit includes everything you need to install a pair of Rigid Industries back-up lights on your vehicle: Two LED lights, and extended 25’ wiring harness hardware and black covers. This kit features our patented Hybrid optics system combined with a Diffused lens, to offer a powerful 60deg beam pattern for unmatched visibility. SR-M (Single Row Mini) – The Rigid Industries SR-M LED Light is one of the most versatile lighting products on the market today. This compact LED light can be used for virtually any lighting application – from off-road to agriculture. The SR-M utilizes the same technology as our D-Series, but is half the size and incorporates half the number of LED’s. The size and shape of the SR-M LED Light allows it to fit almost anywhere. Its cast aluminum housing and polycarbonate lens are sealed against the elements for years of trouble-free operation. Flush Mount – This particular model is specifically designed to be recessed into a truck bumper, a utility bed, the hull of a boat, or any application where you need the light to look clean and be out of the way. Once installed, the light is only 1/4” tall, which means you can have all the benefits of our surface mount lights in an OEM quality, flush installation. Hybrid Optics – Our patented Hybrid optics system is the most powerful, most efficient LED optics system on the market. Utilizing a combination of lens and reflector, the Hybrid optics system captures the maximum amount of light emitted from the LED and projects it exactly where you want it. Diffusion Lens – Perfect for scene or area lighting, our diffusion lens was specifically engineered to project light at a 60º flood pattern. Combine that with our patented optics and you have the best LED flood light in the industry. Like our standard lens, the diffusion lens is made from optically clear, unbreakable polycarbonate plastic.